A month or so ago, we were helping a friend “consciously” die. It was a wonderful experience that released him from his pain and immobility (which he said was “no way to live,” regularly asking for a shotgun when we inquired what he might need), and brought together a community of friends to support his decision to quit eating and drinking. We had nurses and chaplains and shamans in our group, as well as plain-old caring people – to talk and read and sometimes watch TV with him – and singers – us! After he had passed, we all realized what a blessing we had not only provided but had received. 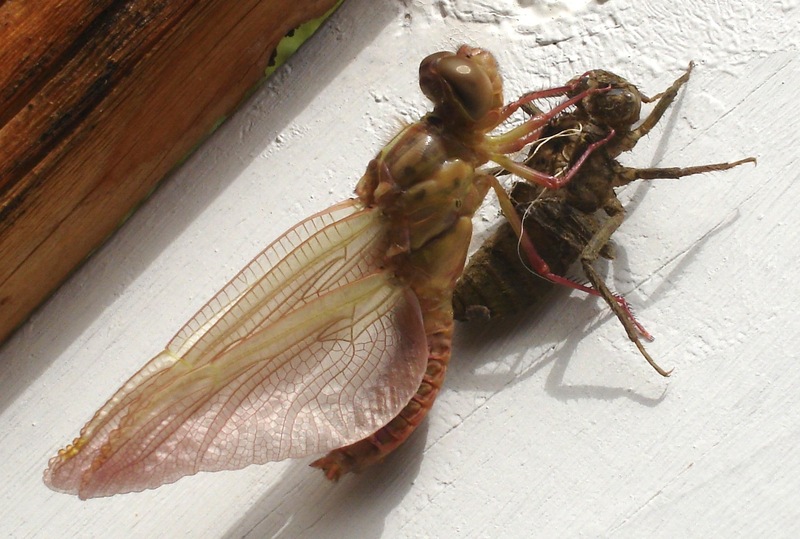 A few days before his passing, we were working at home when we found a strange-looking insect emerging from a hard shell. I thought it looked rather monstrous. 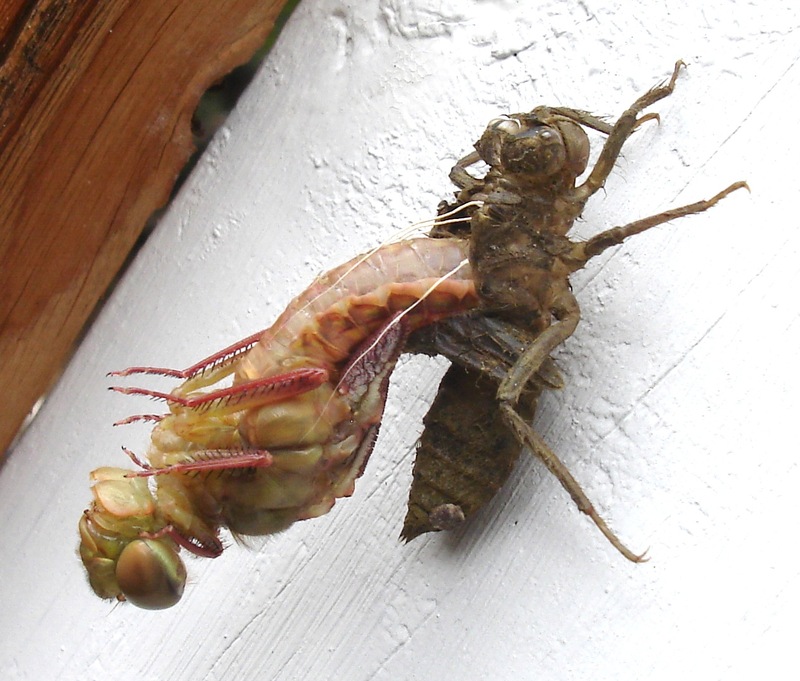 Within minutes, the monster had turned into a fairy-like thing with ruffled wings! And within the hour, the wings were dry and extended, ready to fly. And it did fly into the elderberry tree above the pond where it had – we understand now – climbed out. I knew the dragonfly as a totem guardian of the portals to other realms, so I’d thought this was a good harbinger of our friend’s passing soon. It would be two more days before he passed – but it’s common for dying people to commune for days with loved ones on the other side before they complete their passing, and we thought the dragonfly represented the opening of those portals for those important communications. 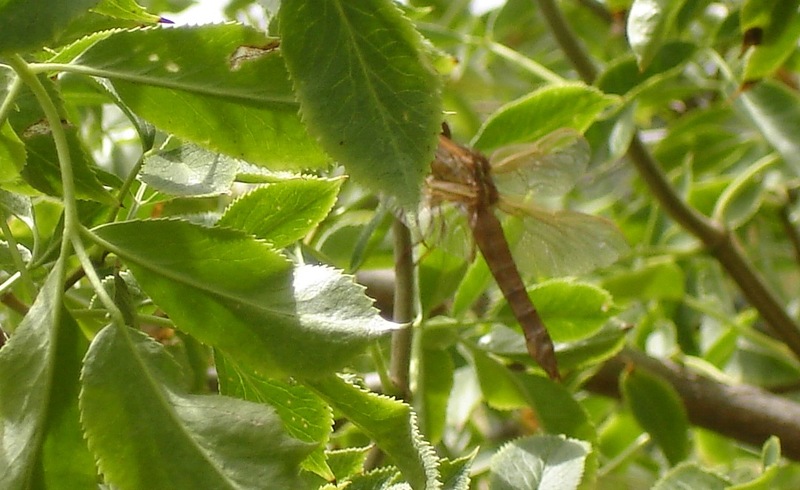 When we sent the photos to the man’s wife, she was doubly moved, because the dragonfly had aways been their totem. We were very moved by the idea of a life form suddenly following an impulse to do what it had never done before, climb into the light and allow itself to dry and even burst! Wouldn’t most of us want to fall back into the familiar water? The teacher uses the term “vaporize” for what we need to allow to be done to certain aspects of ourselves. In this case, the dragonfly’s excess moisture did need to literally vaporize in order for it to fulfill its destiny. I love it. Wishing us all faith in a process we may not yet understand. It might look ugly. But let’s not despair. I do believe there’s new life ahead. Categories: Counsel | Tags: dragonfly, dragonfly metaphor, dragonfly metaphor for transformation, spiritual healing, Transformation | Permalink. Energized to Speak So Much Truth! Last week I wrote a blog on ParadigmSalon.net, titled “New Starting Point.” I’d finally realized I’d written for too long the way I’d been taught as a radio journalist: simple, 6th grade level for the average American – and finally realized that it wasn’t working, at least for “this stuff.” I couldn’t get in “the people’s” shoes and still take my leaps. I decided to quit writing from anyone’s vantage but my own. I’d write only from my own, real, only partly-journalist self – the one who’s been drifting between dimensions all of my life, trying to act normal, and finding it quite a struggle. Since January I’ve been having two weeks at a stretch every month when I can hardly function, and Greg has to do most of the work and bring in the income. I’ve been apologizing, but we’ve both felt that something good was coming out of all the extra sleep. And suddenly last Full Moon, something got me out of bed, and I wrote for hours, suddenly understanding quite clearly the work I’m supposed to do, which brings together everything in perfect harmony that I have ever done in my life, but in a totally surprising way – to me. I need to articulate what I see in the world, and what I see is a moment of history in which people wake up and speak their truth. The urgency of this moment requires our bodies, minds, and souls; and it’s our bodies, minds, and souls that will experience the benefit. The involvement of our souls is what makes it right that this conversation be in a church. Now, that’s the part that daunted me, that has held me back for over a decade when this sort of idea first seemed like “crazy stuff” that would’t go away. The idea had a sort of reality to it, so I was ordained, but then mostly forgot about it. Besides, I thought, I have nothing to tell anyone, as I’m still fighting these things called demons. 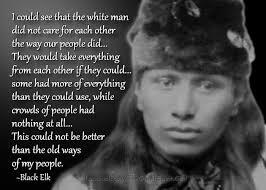 Then a few months ago, Greg read to me the introduction of Black Elk Speaks, about how he had had visions like me for all his life too and was tormented by demons until he finally accepted his calling. His description of the struggle stunned me, as he could have been describing my last decade-plus. With astonishment, I told Greg, and God, that I would accept this calling and act when I understood it. A few weeks went by, and the concept felt certain, but I saw no details, no practical first steps, so I didn’t think about it, other than that it was interesting, more “out there” than I like to be, and I wondered if my Spirit Help would actually convince me to do anything. Suddenly, as I said, on the night of this last Full Moon, I got up and, not having had any ideas before, suddenly “saw it” and drafted almost everything I needed to define this church and ministry here on this website. And I’ve been polishing and expanding it for four days straight, and I’m totally energized by speaking this much truth! So that’s how it’s come about, Friends. I never wanted to take on this role, but now that I’ve written all this (including my own spiritual history – nice to not hold it secret any longer), it feels very comfortable and right. I have a short list of upcoming sermons I’m looking forward to writing. So please check out this website, MK Garden Healing, and if the Spirit moves you, become a member and subscribe. Categories: Announcements | Tags: Black Elk Speaks, mind control healing, New Church, New Minister, spiritual healing, Transformation | Permalink.